For Great Lakes or small fishing holes, only one name will do. When you’re chasing horizons, you want an outboard that delivers optimum performance and peace of mind. Which is why you want the Honda BF135 and BF150. These engines created the benchmark for a new generation of marine engine technology, and they’re the choice of center console, catamaran, pontoon, and bay boat owners across the country. Both motors feature advanced Dual Overhead Cam, in-line four-cylinder architecture, a benefit from decades of Honda automotive and racing experience. Racing experience means more horsepower and instant throttle response. Honda’s exclusive Dual-Stage Induction delivers top performance at every rpm range. And Lean Burn Control automatically adjusts the air-fuel mix to maximize power and fuel efficiency. All of which makes it clear: when it comes to boating, nothing beats the fuel efficiency and precision standards of Honda. RELIABLE, EFFCIENT 4-STROKE DESIGN: World-renowned Honda quality combines proven reliability and superior fuel efficiency, with no oil mixing. LEGENDARY QUALITY BASED ON HONDA ACCORD AND CRV: By sharing many components with the Honda Accord, and CRV automobiles, the BF135 and BF150 gain years of proven Honda engineering and reliability. VTEC® - SMOOTH ACCELERATION AND POWER (150hp): Featured on the BF150, Honda’s Variable Valve Timing & Lift Electronic Control (VTEC®) system provides power where and when you need it. VTEC gives you a broader, flatter torque curve and smooth power delivery throughout the engine’s operating range. The result is a superior combination of power, torque and fuel economy. VTEC is the modern replacement for displacement. DUAL STAGE INDUCTION - BREATHING EASIER IMPROVES PERFORMANCE: Honda’s unique variable intake system optimizes air flow to match the engine’s speed. The result? Maximized combustion efficiency, increased torque, and superb fuel economy. LEAN BURN CONTROL® - SUPERIOR FUEL EFFICIENCY: Lean Burn Control® increases fuel efficiency by allowing combustion to operate on a leaner air/fuel mixture. At cruising speed, this engine runs on up to 20% less fuel* than others in its class. *Based on EPA Specific Fuel Consumption Mode. MULTI-PORT PROGRAMMED FUEL INJECTION (PGM-FI) - POWERFUL PERFORMANCE: Programmed Fuel Injection delivers the precise amount of fuel/air to each cylinder. The result is easy starts and instant throttle response with superior fuel efficiency. DUAL OVERHEAD CAM (DOHC) - HIGH HORSEPOWER, LOW MAINTENANCE: A powerful, compact 24-valve DOHC design creates more valve lift to pull in more air for increased horsepower. Low-maintenance design allows easy adjustment of the rocker arms. No multiple shims or trial-and-error adjusting needed. NMEA 2000 - ON-BOARD CONNECTIVITY: NMEA 2000 protocols allow engine data to be interfaced with on-board systems and systems displays, such as sonar or GPS. TRUE 5 WARRANTY: Honda's True 5 Warranty is the best in the business. This transferable, non-declining warranty is the same on the last day as it is on the first. SUPERIOR BATTERY CHARGING - MORE USABLE POWER: Honda's proven "on demand" 51 amp belt-driven alternator reduces heat buildup and provides superior battery charging capability - 30 amps at 1000 RPM and 40+ amps above 2000 RPM. ENGINE ALERT SYSTEM - KEEPS YOU INFORMED: The ECM monitors vital engine functions and prevents engine damage by alerting the operator of: Overheating. Water in Fuel. Low Oil PSI. Battery. Over-Rev. Critical Engine Function. FISHERMAN FRIENDLY VARIABLE SPEED TROLLING: The BF135 and BF150 offer optional push-button variable speed trolling control. Simply push the toggle switch to adjust the trolling speed in 50 RPM increments from 650 RPM to 1000 RPM. 4-FRONT CORROSION PROTECTION SYSTEM - FIGHTS THE ELEMENTS: A patented, "Double Sealed" multi-layered paint process. Sacrificial anodes and stainless steel technology, along with waterproof connectors, all enhance corrosion protection. ENGINE COMMAND MODULE - OPTIMUM PERFORMANCE: The ECM receives constant input from 18 different sensors to deliver instant starts, smooth operation, strong performance and excellent fuel efficiency. LAF & KNOCK SENSORS - OPTIMUM EFFICIENCY: Linear Air Fuel (LAF) and knock sensors help determine correct fuel flow and ignition curve to maximize performance and fuel efficiency. COUNTER ROTATION AVAILABLE: Counter rotating models are available for multiple engine applications. These models improve efficiency, hull maneuverability and decreases driver fatigue. POSITIVE LUBRICATION - BETTER DURABILITY: A crankshaft-driven, automotive-style trochoid oil pump ensures long-term durability of critical engine components. CONVENIENT SINGLE LATCH COWL: A single front-mounted latch combines with 4 securing points to ensure a water-tight seal. SEALED STARTER - PROTECTION FOR LONG LIFE: The starter motor is inverted into a sealed chamber that protects the starter drive from the elements. FRESH WATER FLUSHPORT: Flushes debris and saltwater out of the engine, extending the life of the outboard. STAINLESS STEEL COMPONENTS (STEERING ARM, TILT TUBE AND ALL SHAFTS) - CORROSION RESISTANCE: Stainless steel components provide durability with long-term corrosion resistance. BUILT-IN PITOT TUBE: Built-in pitot tube in the gear case eliminates the need to drill holes in your boat for installation. AVAILABLE IN: 20, 25 in. Shaft Models. 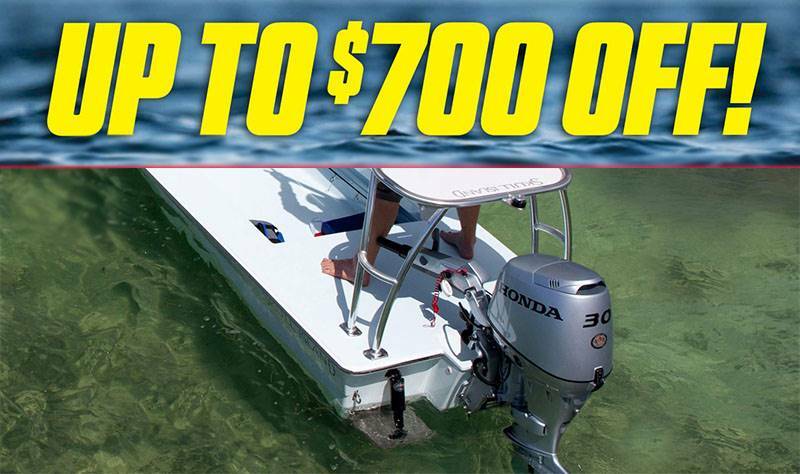 Honda Marine - Up to $700 OFF! THE HONDA POWER OF BOATING CELEBRATION! *USED VEHICLE info: Price, if shown, does not include government fees, taxes, dealer document preparation charges or any finance charges (if applicable). Final actual sales price will vary depending on options or accessories selected. *NEW VEHICLE info: Price, if shown, does not include government fees, taxes, manufacturer destination charge, dealer preparation charge, dealer document preparation charges or any finance charges (if applicable). MSRP and/or final actual sales price will vary depending on options or accessories selected. MSRP and FPH Price exclude destination charge. Visit powersports.honda.com to view applicable destination charge amount.